Today’s post is written by Andrea May, #chat2lrn crew member and Vice President of Instructional Design Services at Dashe & Thomson in Minneapolis, MN. Andrea is an instructional designer, project manager, wife, mother, Girl Scout troop leader and theater artist. Find her on Twitter @andreamay1. Buy-in. This is an easy concept to understanding in terms of investing money. You find a company whose product you love, or that you agree with in terms of fiscal or, perhaps, environmental policies, or that has just historically provided a great ROI, and you buy-in by purchasing shares in that company. The company gets an influx of cash and you get to share in the profits. Buy-in is a little more difficult to define when it comes to selling people on a necessary change. Even though change is one of the only constants in life, we human beings don’t like change and generally resist it at every opportunity. We have cognitive biases that lead us to keep the status quo. We are even more likely to resist a change when “WIIFM” is unclear. So let’s say your organization or client is implementing a new system company-wide and training is required to get everyone up to speed and ready for the change. You should be able to sign-up everyone for the appropriate training, get them through their courses, and have everyone ready to start using the new system day 1, right? Nope, not right. In fact, that approach is practically guaranteed to fail. The reason it would fail is buy-in or, more specifically, a lack of buy-in at one or more levels of the organization. In this scenario, a handful of people at the top levels of the organization have bought-in to the idea that a new system will improve efficiency, eliminate redundancy, and have a positive impact on the bottom line. They have bought into this idea to extent that they authorized a large sum of money to purchase and implement the system and have assigned the project to the folks below them in a position to make the project happen. This is the first place where buy-in can start to break down. If the executives don’t make the effort to get buy-in from those below them, all the way down to the people the front line, the change will be an ongoing struggle at best and an outright failure at worst. A lack of buy in from the project team can cause delays in the timeline and corners being cut. A lack of buy-in from middle managers can cause little or no enthusiasm for the change in those below them. 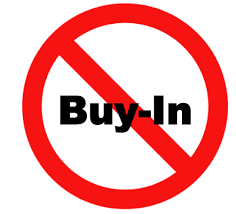 A lack of buy-in from those on the front line will throw a wrench in system adoption and can easily turn a multi-million dollar investment into a very expensive lesson about the importance of buy-in at all levels of the organization. Join us for #Chat2lrn this Thursday, November Nov 3rd 9:00am PDT/12:00pm EDT/4:00pm GMT to discuss the importance of buy-in to the success of your projects. Today’s post is written by Andrea May, #chat2lrn crew member and Vice President of Instructional Design Services at Dashe & Thomson in Minneapolis, MN. Andrea is an instructional designer, project manager, wife, mother, Girl Scout troop leader and theater artist. Cognitive biases color almost every aspect of our daily lives. We all have them, whether we want to admit it or not. They develop through our lives as we gain experiences that allow us to take “mental short-cuts” to navigate situations and make decisions. They are usually an indication of our values and beliefs, and in many cases cognitive biases can be helpful. Cognitive biases can help us make decisions more quickly in situations where time is of the essence. They can help to keep us safe in times of heightened emotional or physical stress. But cognitive biases can also lead to bad judgments and a resistance to learning and incorporating new information into our thought processes. As learning and development professionals, it is imperative that we maintain an awareness of both our own cognitive biases and also an understanding of the common cognitive biases that the majority of us, as humans, hold on to. By keeping these common biases in mind as we design and develop instructional materials and events, we can incorporate strategies to mitigate them and open the way for learning. Confirmation bias: This is the tendency to easily accept information that confirms your point of view and reject information that does not support it. Anchoring bias: This is the tendency to place excessive weight or importance on one piece of information – often the first piece of information you learned about a topic. Dunning-Kruger effect: This is the tendency for incompetent people to overestimate their competence, and very competent people to underestimate their competence. Curse of knowledge bias: This is when well-informed people are unable to look at an issue from the perspective of a less informed person. Functional fixedness: This bias limits a person to utilizing an object or idea in only the way it is traditionally used. Mere exposure effect: This is the tendency to like something just because you are familiar with it. Not invented here bias: This is the tendency to discount information, ideas, standards, or products developed outside of a certain group. Reactance: This is the urge to do the opposite of what you are asked to do in order to preserve your freedom of choice. Status quo bias: This is the tendency to want things to stay relatively the same as they have always been. System justification bias: This is the tendency to try to actively maintain the status quo. Are there biases that you attempt to mitigate in your work? What strategies have you found to be effective? Join us for a #chat2lrn about cognitive biases in learning on Thursday July 2nd, 8:00am PDT, 11:00am EDT, 4:00pm BST.